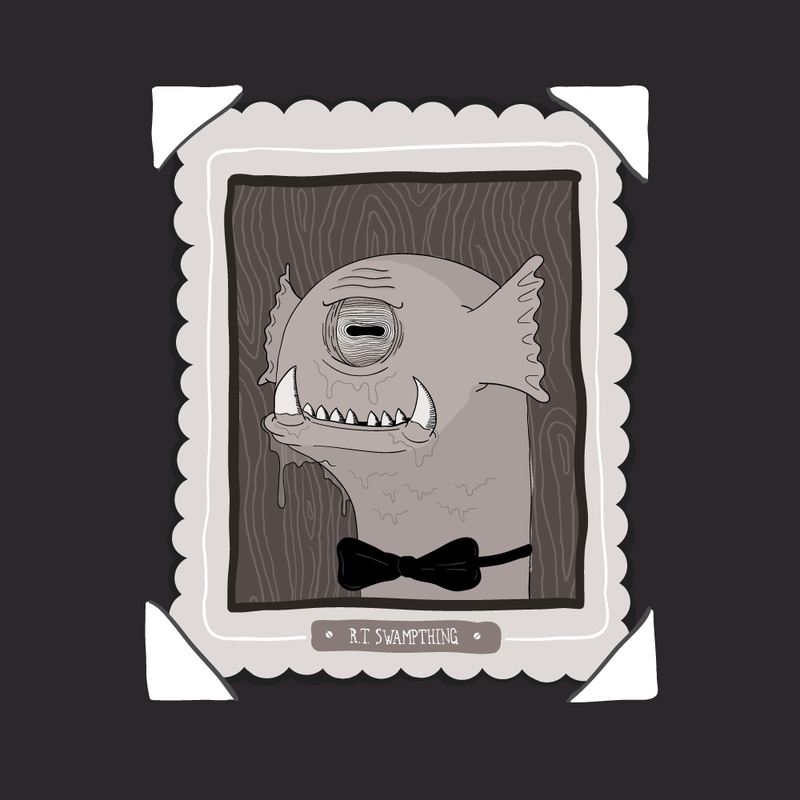 Today’s illustration is of the late statesman and all round gentleman, Reginald Theodore Swampthing. When not terrorising locals or devouring small fish and crustaceans, Reginald could be often be found tending to his stable of prize-winning racehorses, talking a nice stroll long the banks of the local river or serenading his childhood sweetheart and later wife, Penelope Margaret May Swampthing (nee Winterbottom). Mr Swampthing ran for public office in 1962, becoming councilor (and later Mayor) of the Lakeside District. He served with dedication and gusto right up until his death in 1973 from an apparent pitchfork to the chest. No charges were laid as the Swamp Monster Protection Act of 1974 had not been passed into law, although it was common knowledge that the townspeople often enjoyed an old fashioned angry mob get-together after local football matches and Mr Swampthing may have unfortunately been in the wrong swamp at the wrong time. Knocked this fella out at 1.00am this morning… had the idea for a swamp monster thing, started drawing and an hour or so later here it is. It was colour to begin with, but really wasn’t feeling it so took the easy option and converted it to black and white, drew an old school photo album background and whammo! As always, done in Illustrator with the Wacom board. Another reason I use Illustrator is I’m rubbish with a pencil and paper. With the computer I have multiple undos and can work a lot quicker than drawing on paper and having to rub out every second line. I will however, do a few ‘One a Day’s’ the old school way just to compare…. soon. maybe. And thus I come to the present days project! Love the history behind Reginald, he’s quite the distinguished Swampthing now isn’t he? Can’t wait to see what’s next!